Mount Blackburn photo | how to photograph in arctic cold conditions, Alaska. 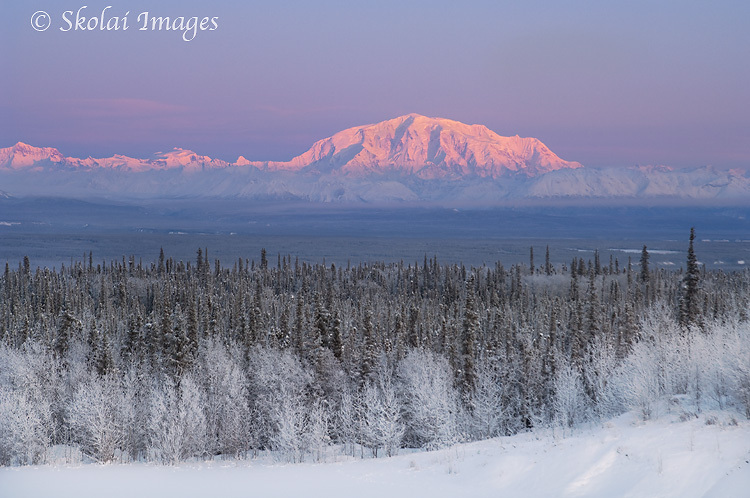 Mount Blackburn Photo, Wrangell Mountains and the Copper River Basin, Wrangell - St. Elias National Park, Alaska. Please click on the image above to view a larger version of this photo. Here’s a view of Mount Blackburn and the Wrangell Mountains, at sunset. One of the hassles with shooting in Alaska in the dead of winter is, of course, the cold. We all understand how that’s a hassle, right? Cold fingers, batteries that die, and so forth. The list goes on. Getting a vehicle started at 40 below zero deg F is itself an art. An engine block heater for your car helps – well, it’s pretty much a ‘must have’. But at minus40deg, even that won’t get you far. The engine block heater helps warm up the mechnical parts of the engine block, but at these frigid arctic temperatures, even the oil thickens up so much it doesn’t flow; problematic for a car engine. So , an Oil Heater works well. Another useful tool is something to warm up the battery. The 3rd item that’s a good tool to have is a battery heating pad – cold temperatures can dramatically affect the cranking power of a battery, so heating it up will help get your car started. So those 3 items are all good, if not critical, things to have handy during the Alaskan winter. I, of course, do not. I do have a block heater in my truck, but the other items, well, I don’t have. And so my recent trip to frigid Wrangell – St. Elias National Park and Preserve over the holiday season was somewhat fraught with frustration. However – it’s not quite so simple as just buying a few heaters. You then have to plan ahead. Like, seriously, hours ahead. Sunset over the winter solstice can be as early as 3pm. Which means you want to step outside by about 1pm, to give you time to start the vehicle, let it warm up a bit before you drive off, then drive to your location, and shoot the great light of the Alaskan winter. So, what this means is you need to have all those items mentioned above plugged in and running as much as 3 or 4 hours ahead of time. If you don’t, and you wait til, say, 11am, forget about driving anywhere, and either sit by the fire and read your book, or take a nap. Next up; realize that even with all this, your vehicle may still not start when the temperatures dip so low (OK, 40 below zero isn’t really a “dip”, agreed). Sometimes, you’ll need to go a step further. You might want to grab your friend Mr Heater. This little propane heater blows hot air out and can heat up the underside of the vehicle. Place the heater at the front of your vehicle, and blow the air under the front of your vehicle. Careful though, don’t overdo it. A block of wood placed across the middle of the vehicle, blocking the air from simply blowing out the backend, and forcing the hot air to stay under the engine makes a difference. And yes, if it wasn’t so da** cold, I’d have taken some photos to show you how this works. Then, finally, you MIGHT get your car started. Or not. Propane has a low boiling point of about -45deg, so if it gets much colder than this, your propane heater won’t work. If not, go back to the fire, make more hot tea, and read your book some more. OK .. so, now you’ve finally got your car started. Drive to a trailhead of your choice. If you have trouble starting up a snow machine, you might end up having to drive back to where you started from, and try the whole process again tomorrow. Because I guarantee you it’s dark by now. This entry was posted in Adventures, Alaska, Cool stories, Landscapes, Musings, Photography, Winter, Wrangell - St. Elias National Park and tagged Landscapes, Mount Blackburn, scenics, Winter, Wrangell - St. Elias National Park on January 20, 2011 by Carl D.
That brings back the memories! It would take me about an hour with everything plugged in including a Ready Heater to get me truck started each morning so that I could drive to school! Then between classes, I remember everyone running out and starting their vehicles – as long as you ran it for a bit each hour, it would start at the end of school without being plugged in. Everything is so much more work in the cold. Ahhhh yes … good times. We have’t seen -40 here for at least a decade, but we used to get down to those temps a couple of times every winter when I was growing up. Coldest we ever had here was -44C I think – definitely a ‘read a book’ day! Not sure what’s worse … -40 temps or the 3′ to 4′ of snow we’ve been getting since the New Year’s day (another 10″ last night)! Great post, Carl! I remember living in Wyoming, and having to start my Subaru at -30F. I never had a block heater, but it was a challenge some mornings. My graduate advisor went to grad school in Fairbanks; he told a story of driving down an Alaskan highway one January day, and meeting a guy who had started a small fire underneath his truck in order to get it started. Probably somewhat tenuous, but necessary in that kind of cold–especially if its the only way out you’ve got. Really interesting post Carl. Don’t know if I will ever experience -40, but it is obvious it is a bit out of the realm of “typical” cold weather photography.